March 10, 1933—A Day to Remember! California’s Department of Conservation has an entire webpage devoted to the Long Beach Earthquake of 1933 at http://www.conservation.ca.gov/cgs/News/Pages/LongBeach.aspx. 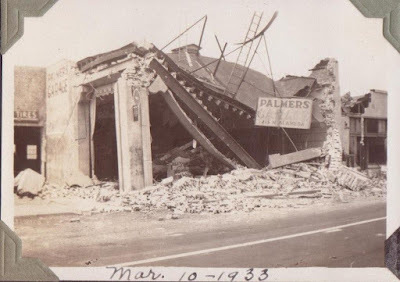 Learn what the earthquake did to the city; why your ancestors never forgot March 10, 1933, if they lived in the area; and where links to photos of the devastation will take you online. The photo of Palmer’s Garage above gives an example of what happened to just one building! Southern California Earthquake Center: http://www.scec.org/education/030310longbeach.html. Film footage of the destruction: https://archive.org/details/con_00002. Juanita Lovret recalls her experience: http://www.ocregister.com/articles/tustin-291357-damage-house.html. Post card pictures of the devastation: http://www.usgwarchives.net/ca/losangeles/postcards/ppcs-1933quake.html. RESEARCH TIP: If one or more of your living relatives were children during the earthquake, or, if they can recall their parents’ reactions to the big shake, record their memories for an oral history project. 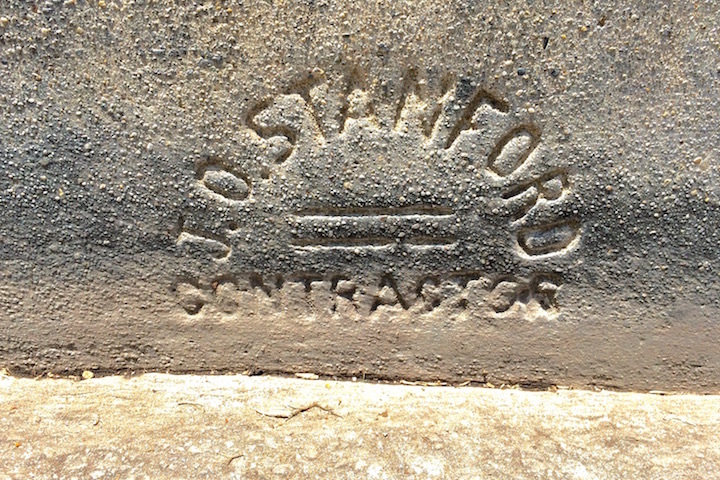 Was your ancestor employed by the WPA? The Works Progress Administration was very active in Long Beach during the Great Depression. Our old Municipal Auditorium downtown produced WPA musicals, and many Long Beach landmarks still standing today were built by WPA workmen. In the coming week we will be exploring Long Beach in the 1930s: Long Beach’s earthquake of 1933, schools built, roads paved, curbs laid, murals painted, and other Great Depression evidence left behind in our city. Your ancestor may have contributed to one or more of these projects, so stay tuned! 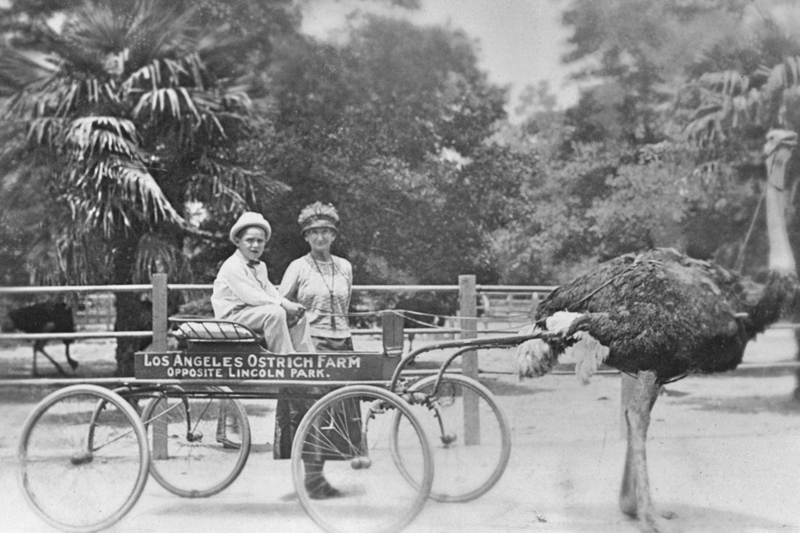 If you would like to experience Southern California as an early 20th Century visitor might have, “A Visit to Old Los Angeles and Environs” by Brent C. Dickerson, copyright © Brent C. Dickerson, is exactly what you’ve been looking for. Vintage post cards of the era illustrate scenes described by the midwestern visitors, and sound effects add to the experience. For a complete list of cities, towns, and areas covered in Mr. Dickerson’s online presentation, go to http://web.csulb.edu/~odinthor/socal1.html and click on the subject of your choice from a list of 30 episodes. Eight of these are devoted to Long Beach, San Pedro, and Catalina. RESEARCH TIP: Old post cards are online at various state, county and city pages of the U. S. GenWeb. If you have been looking for pictures of your ancestors’ home towns and haven’t been able to find any, try looking on GenWeb sites. 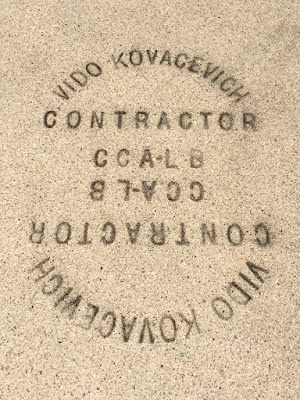 Long Beach’s sidewalks contain impressed “signatures” of many construction companies and contractors who plied their trade in the city. 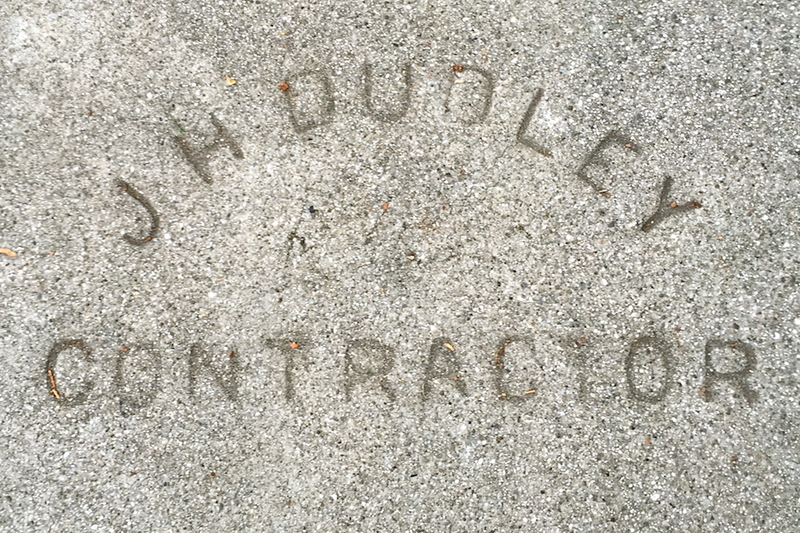 If your ancestor owned or worked for one of those companies, our “Sidewalk Signatures” series will be of interest to you. John J. Lewis was a cement contractor with an office at 233 E. Broadway and a house at 61 N. Loma Ave. in the Belmont Heights neighborhood of Long Beach. According to the 1920 U. S. Census, Mr. Lewis was from Wales, and he is mentioned in Long Beach City Directories between 1914 and 1923. Intersections, people, buildings, stores of all types, churches‚ aerial views—you name it, the LAPL has a photo of it from times gone by. 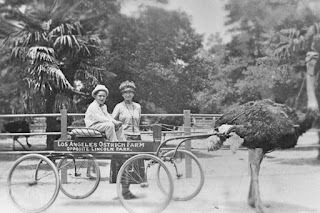 Use this resource to augment information about your Long Beach ancestors and flesh out your genealogy. 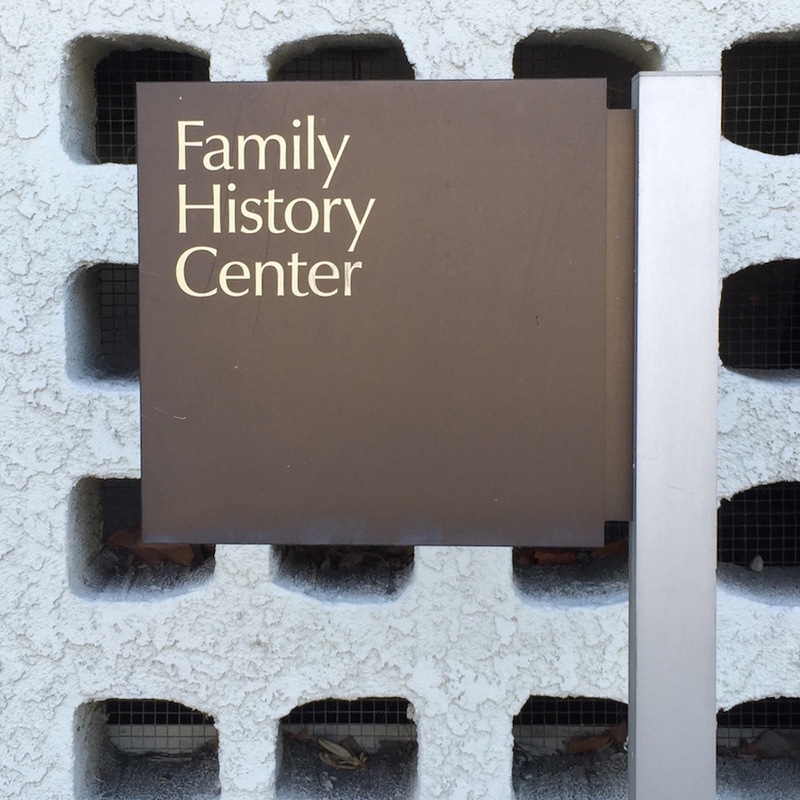 The Family History Center is located in the Bixby Knolls neighborhood of Long Beach at 3701 Elm Avenue. QHGS volunteers enjoy helping people search for ancestors on the Center’s computers, and we’re ready to assist visitors who have ordered microfilms as well. 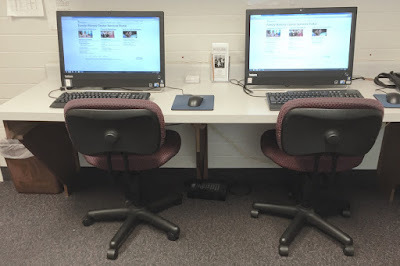 Family History Centers (now called “FamilySearch Centers”) are open to all, and research at the Centers is free. 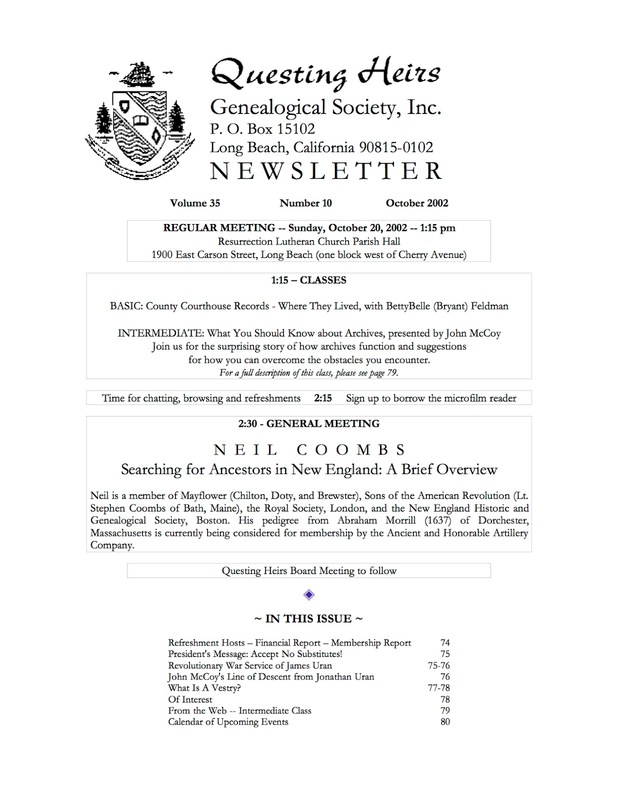 Access Ancestry.com., Fold3, and NewspaperArchive.com, as well as many other databases to provide information for your genealogy. Visit your local Family History center soon—there’s an empty chair and a computer waiting just for you! Many beginning genealogists assume that they will not be able to find any records of their Italian ancestors before 1809 because that is the date when most FamilySearch films begin. While it is true that civil vital records started in 1809 when the Napoleonic Code went into effect, marriage records from 1809 to 1865 often contain copies of church records from the 1700s because the Italian legal system requires several documents before a marriage can be performed. These original notarial documents and copies of older records are collected into packets which are filed together, first by marriage number and then by year, at the municipal level and in state archives. Many of these packets, called allegati or processetti, have been digitized at the FamilySearch website or are available on microfilm from the FSL—an extremely fortunate state of affairs for genealogists! When researching Italian marriages, note the number on the marriage certificate and find the corresponding packet. Examine the documents inside the marriage packet carefully. The least you will find is the baptism/birth records for the bride and groom, a copy of the banns posted a month previous to the marriage, and a copy of the civil marriage record itself. 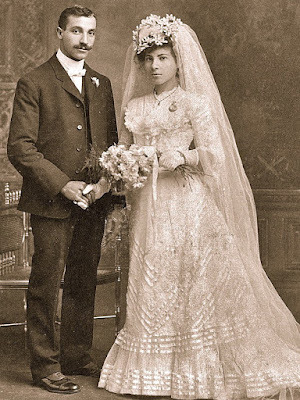 The most you can find may include all of the above, as well as death records for each spouse’s parents, death records for their grandparents, death records for the former spouses of the current bride and groom, original documents recording parental consent, and the record of their church marriage. RESEARCH NOTE: Had I accepted the evidence that my 4G grandmother Gaetana DiBona’s marriage to Francesco Paolo Pinto took place “c. 1805,” and not bothered to search further, I would never have found her two subsequent marriages in 1818 and 1832 which yielded 1.) the death record of Gaetana’s father (1783), 2.) the birth record of Gaetana herself (1778), 3.) the name of one of my 6G grandfathers (it was in Gaetana’s mother’s consent document appended to the third marriage), and 4.) the surprising fact that Gaetana’s first husband, Francesco Paolo Pinto, my 4G grandfather, had died, not in Corleto Perticara as I had assumed, but in the provincial capitol of Potenza—in prison! Thanks to QHGS archivists and historians who saved “almost everything,” our organization is fortunate to have hard copy newsletters dating back to 1977—newsletters we can consult to find out who our officers have been, how often we have moved meeting locations, and which genealogical issues concerned the family historians of forty years ago—newsletters that show us where we came from. Complete years of our newsletter from 2003 to the present day are available on the “Past Issues” page of our website, and our Digital Archivist is busy preparing more old QHGS newsletters for posting online. Although it is true that much of the information contained in them is now out-dated, there are still many articles worth reading. 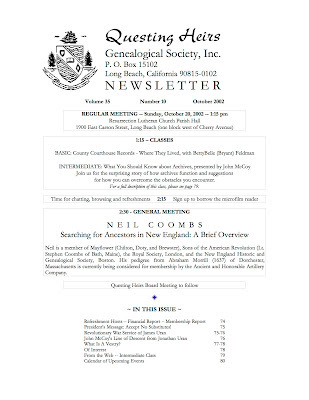 If you would like to find out more about our genealogy club’s past members, projects, seminars, and speakers, explore these newsletters for free at http://www.qhgs.info/newsletter-past.html. 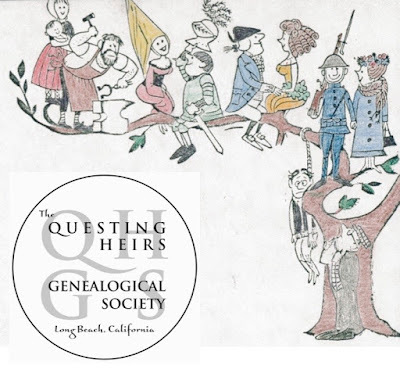 RESEARCH TIP: If your Long Beach ancestors were interested in genealogy during the 1970s, 1980s, and 1990s, chances are good that they belonged to QHGS. Check out the old online newsletters to search for their names and activities. I doubt that there are many genealogists who would want to return to the “old days” when viewing census records depended on a microfilm reader and copying documents resulted in wet, white-on-black images of birth register pages. On the other hand, there is one very useful technique from those long-ago days that we should all consider employing as we research our families: copying our ancestors’ census records onto blank census forms for the appropriate year. 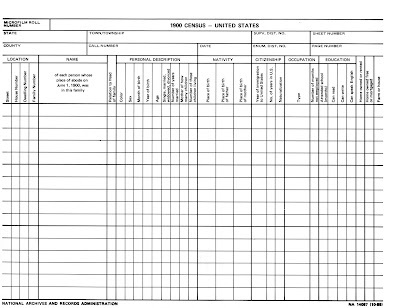 If you’ve never transcribed a census page, give it a try! You’ll feel like the enumerator who asked your relatives questions and wrote down their answers way back when. and the Mid-Continent Public Library has them http://www.mymcpl.org/genealogy/family-history-forms. We all get excited when we find our ancestors listed on a census page, and sometimes we forget to read the entire page thoroughly to find out what is really says. 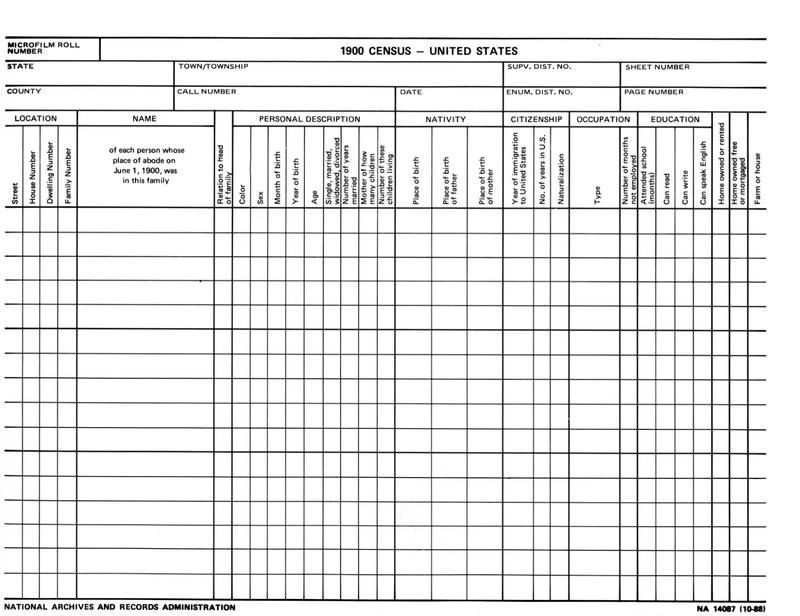 One of the most common complaints I hear when genealogists talk about U. S. Federal Censuses is the seeming lack of consistency in ages recorded. Shouldn’t everyone be 10 years older than they were in the previous census? Well, if all of the U. S. Censuses had been taken using the same criteria, one might expect that outcome. The fact is, however, that each census had different instructions for enumerators recording its information. Lets look at the 1880 census form pictured above to examine three categories: how age was determined, who was included, and who was left out. The 1880 Census column heading for age says, “Age at last birthday prior to June 1, 1880. If under 1 year, give months in fractions, thus: 3/12.” If your ancestor’s date of birth was June 18, 1870, he or she will be recorded as “9” because age is being calculated from the previous year’s birthday (1879), not from the year of the census. This means that the census enumerator had to think in a fiscal way, and, as a result, so do we. The information on the 1880 census includes half of 1879 and half of 1880—not the entire year of 1880. Although ideally the census was taken on the same day throughout the country, (June 1, 1880 in this case), circumstances resulted in thousands of records enumerated after that date. This is why note B is so specific. If an enumerator arrived at the door on July 3, 1880, he had to ask the residents to answer his questions as though it were June 1st. Each census asked different questions and used different date ranges to make those questions and responses statistically relevant. For a history of U. S. Census records go to https://www.census.gov/history/. 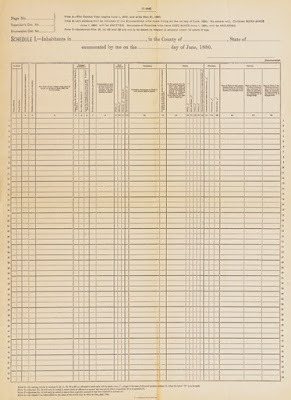 Enumerator instruction booklets in pdf format for various censuses are available at https://www.census.gov/history/www/through_the_decades/census_instructions/. Look for genealogy tips at https://www.census.gov/history/www/genealogy/. A good overview for searching U. S. Census records is at https://familysearch.org/learn/wiki/en/United_States_Census. And, finally, the Access Genealogy website at http://www.accessgenealogy.com/census includes a pdf of Juliana M. Szucs’ favorite “next step clues” which shows how the information you find in the censuses will lead you to more information about your ancestors. RESEARCH TIP: Always look at the census pages before and after the one on which your particular ancestor appears. Relatives often lived close to each other, and you may find more members of the family nearby. As Long Beach’s population grew, people moved out to the suburbs and established churches there. One of these churches, Los Altos United Methodist, has bound volumes of their Sunday bulletins from the founding in 1954. These records are in the church library, and a few of the volumes are shown above. 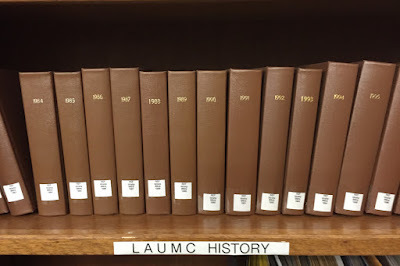 Read about LAUMC history at http://www.losaltosumc.org/history/. Church records can be a valuable source for your genealogy. To access a tutorial about using them for research, go to http://rwguide.rootsweb.ancestry.com/lesson17.htm. http://www.historicalsocietyunitedmethodistchurch.org/genealogy/ lists predecessor denominations, gives examples of denominational newspapers like the Western Methodist, and offers a list of 8 tips for finding Methodist ancestors. RESEARCH TIP: If you are looking for “sidewalk signatures” in your own residential area, don’t forget to look at the curbs.The photo above is not of a sidewalk. 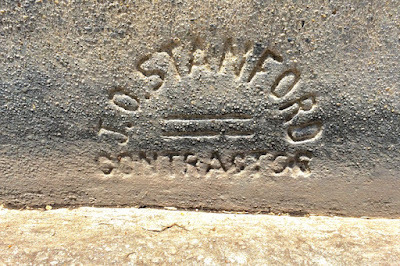 It is an impression on the side of a curb, and, as you can see from the excerpt above, John O. Stanford was paid 29 cents per linear foot for his cement curbing—a pretty good price for 1914. QHGS is happy to announce that our search for a suitable meeting place is finally over. Our new meeting place: the Lakewood Masonic Center Hall, 5918 E. Parkcrest Street, Long Beach, California. Our meetings will now begin a little bit later at a new time: 1:15 p.m.
We hope to see you at our next meeting on September 20th!! September will be here soon enough, bringing school with it, so have some fun now, while it’s still vacation time. Play some of these genealogy-themed games, and entertain your “gen-pals” during Summer’s end. “The Game of Genealogy: How to Find Your Ancestors” includes the board, 5 decks of cards, a score pad, 10 pawns, 2 dice and rules. Learn more about it at http://www.thegameofgenealogy.com/. “Six Generations Card Game” at http://www.sixgenerations.com/ and “The Heirs Card Game” at http://www.sixgenerations.com/Six_Generations/The_Heirs_Card_Game.html are fine examples. “Genealogy 101 Quiz” at http://www.funtrivia.com/playquiz/quiz201826171c2f8.html will test your knowledge while you’re having fun. This website has genealogy-themed crosswords and word search puzzles at http://www.hiddengenealogynuggets.com/familytreefun/. Follow directions to make your own personalized word search puzzle using surnames and genealogical information from your personal family tree at http://www.hiddengenealogynuggets.com/familytreefun/familytreewordsearchtemplate.php. 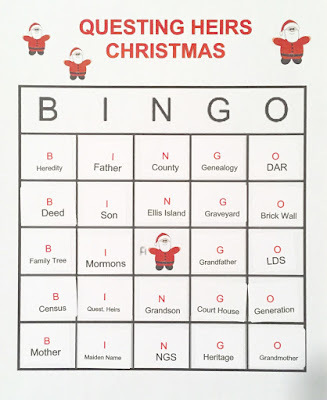 “Genealogy by Barry” has directions for some genealogy-themed games at http://genealogybybarry.com/sharing-family-history-share-family-history-playing-games/. 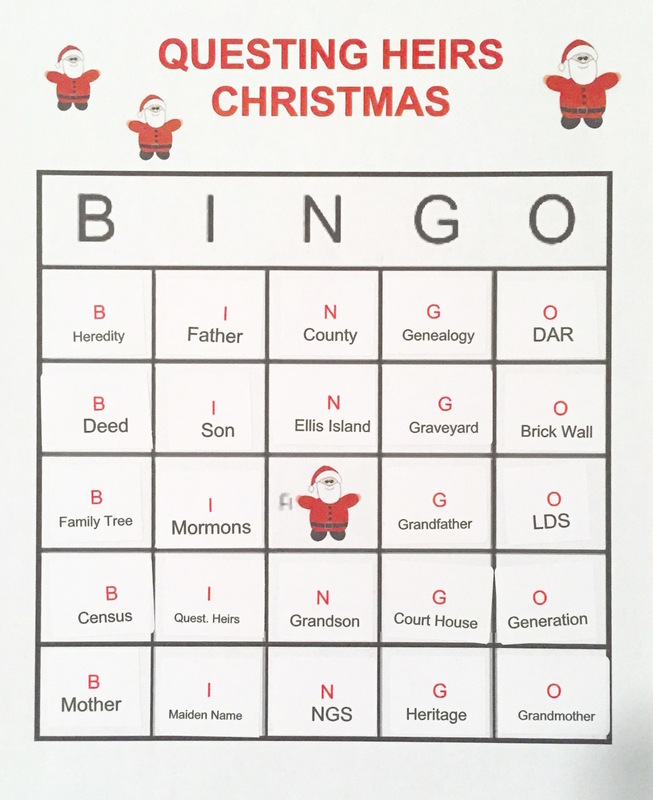 QHGS NOTE: Every year at our annual December pot luck, Questing Heirs members play several rounds of “Genealogy Bingo.” One of the templates we use is shown above. 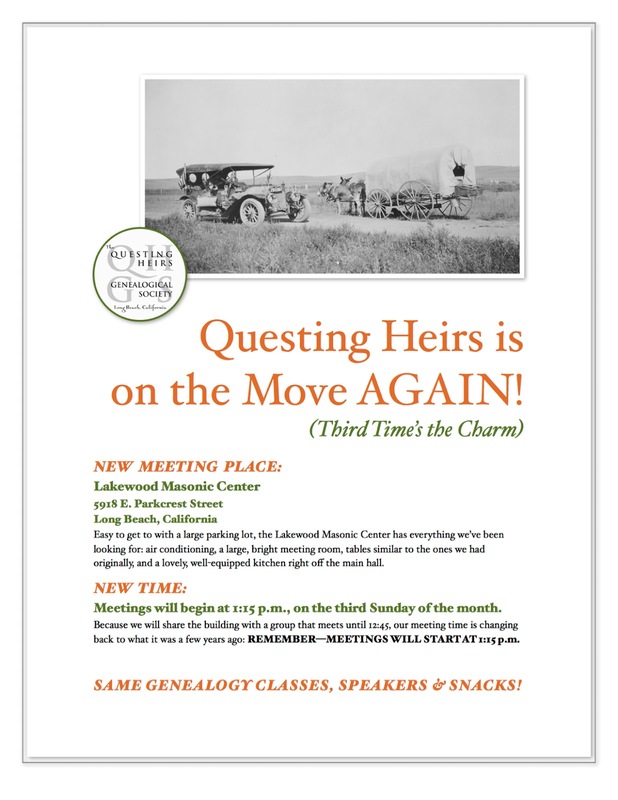 Questing Heirs Genealogical Society has always stepped up to the plate when crises like this occur; so, it is no surprise to learn that QHGS gave money to the “Save the Books” campaign mentioned above. A list of donors published in the Los Angeles Times of December 22, 1986, names our Society as one of the contributors to this fund. 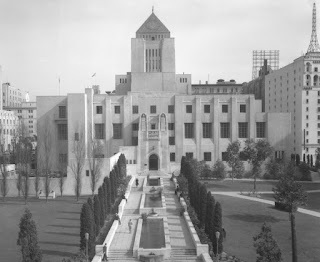 For more information about the LAPL fires, consult “Remembering the Day the Library Burned,” by Glen Creason, Map Librarian at Central Library. This article is posted on the L. A. Downtown News website at http://www.ladowntownnews.com/news/remembering-the-day-the-library-burned/article_4b7f9458-8b3e-11e1-93a8-0019bb2963f4.html. Another description of the fire is on the Los Angeles Fire Department Historical Society website at http://www.lafdmuseum.org/fires_la-library. RESEARCH NOTE: Los Angeles was not the only city to suffer book losses from fire. Our own Long Beach Library’s fire in 1972 was just as devastating. QHGS members volunteered many hours to help clean up. After a new library was constructed at the downtown civic center in 1976, our Society donated over $4,000 worth of books to its genealogy section. 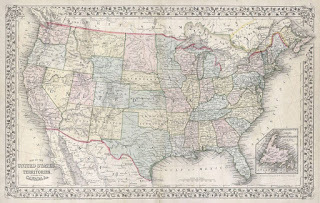 The United States Census Bureau website has an alphabetical list of states with years of their censuses at https://www.census.gov/history/www/genealogy/other_resources/state_censuses.html. One of the state censuses they list might just hold the clue you need to break down a brick wall! 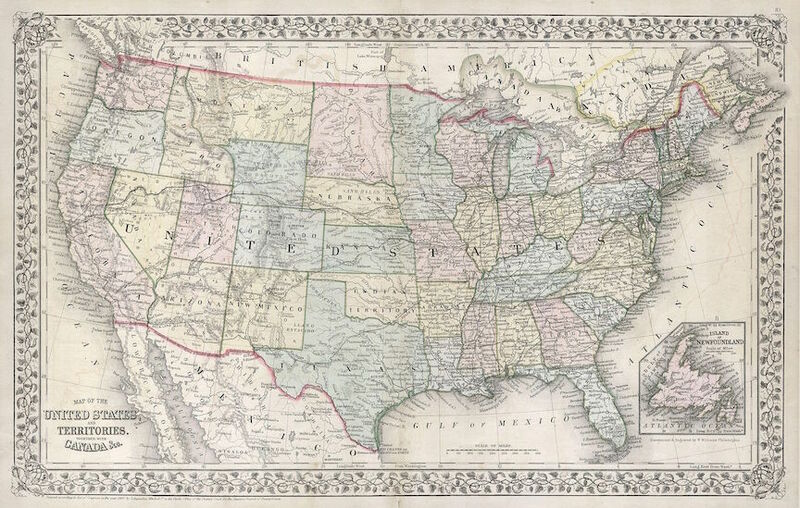 RESEARCH TIP: A state census can help you locate an ancestor who moved between U. S. Federal Censuses. For example: if you are looking for a relative who was in Waterloo, Iowa in 1900, but who seems to have disappeared from that town in the 1910 census leaving no trace, look for your ancestor in the 1905 Iowa State Census. If you find him still in Waterloo, that narrows the time window for his move (or death). If you find him in some other town, you'll know where to look for him in 1910! The FamilySearch website offers so much more than digitized images, indexes, and family tree links. Go to https://familysearch.org/learningcenter/home.html and you will find hundreds of free video tutorials, slide show presentations and audio classes that cover everything from U. S. and European genealogy to specialty subjects for beginning, intermediate, and advanced genealogists. 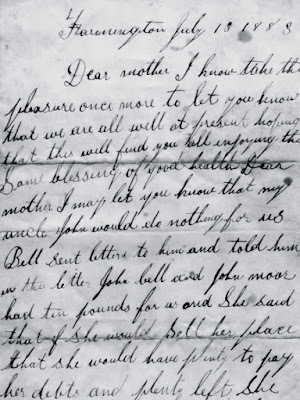 Having Trouble Reading Old-style Handwriting? Learn about the letters of the “Secretary Hand,” a style of handwriting found in many English and colonial records created during the 1500s and 1600s at Reading English Handwritten Records Lesson 1: English Secretary Hand Letters. Explore abbreviations, different ways that dates were recorded, and Latin words that are commonly found in English and colonial records at Reading English Handwritten Records Lesson 2: Dates and Latin Words. 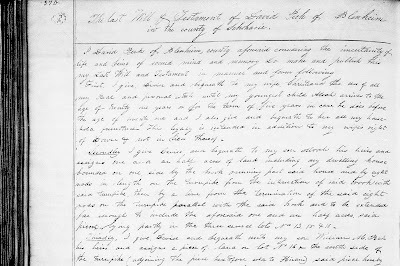 Study English genealogical records, including parish registers, bishop’s transcripts, probate records, and court records at Reading English Handwritten Records Lesson 3: Reading Secretary Hand Documents. Begin with Pennsylvania Research: Vital and Church Records; then continue your research by looking at land records: Pennsylvania Research: Land Records: Field of Dreams; and finish your tutorials with the last lesson: Pennsylvania Research: County Court and Probate Records. You will find that due to the lack of vital records and the difficulty of locating church records in Pennsylvania, court and probate documents are valuable tools. Looking for Special Newspaper Topics? Learn how to use newspaper records that are available in the Abraham Lincoln Presidential Library to assist you with your African American research by accessing Using the Abraham Lincoln Presidential Library's Newspaper Collection to Assist with African American Research. Family History specialist Audrey Collins discusses how researchers can get the most out of the London Gazette, Britain’s oldest continually-published newspaper in her lecture The London Gazette: Not Just the Brave and the Bankrupt. 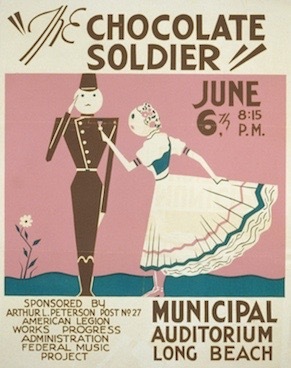 This treasure trove for family and local historians can reveal details of gallantry awards, notices of bankruptcy, changes of name and much more. Want to Learn about Your Ancestors’ Occupations? Researching laborers can be very interesting, and much information can be found if you know where to look. Sources for Tracing Agricultural Labourers covers resources available in The National Archives, parish and county records, and manor, estate and farm records. RESEARCH TIP: We all use online resources to help us research our ancestors; and, all too often, we follow one path, entering information in the same way on the same page, time after time. Get out of whatever rut you might be in, and explore the websites you use most often. You may be surprised by how many additional resources the website offers! Quoting from the National Library of Ireland’s website: “The NLI microfilmed registers from the majority of Catholic parishes in Ireland and Northern Ireland during the 1950s and 1960s. Digital images from these microfilms are now freely available on the website: Catholic Parish Registers at the NLI.” You can access this website at http://registers.nli.ie/. 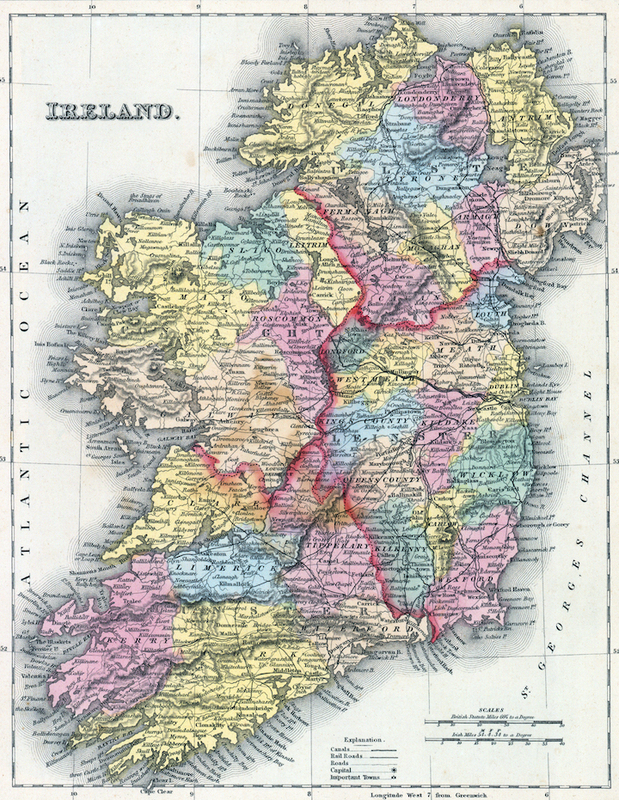 Because the Irish censuses for 1821–1891 were destroyed, very little information is available about ordinary Irish citizens during the 19th Century. In many cases these Catholic parish registers will provide the only record that documents the existence of ancestors who lived in Ireland during the 1800s. They are invaluable for your genealogy research, but—you need to know the name of the Catholic parish where your ancestors’ records were kept to access them. The sources below may help you discover the name of your relative’s parish if you do not know it already. Where do you start when looking for Irish Catholic Church Records? FamilySearch! Go to https://familysearch.org/learn/wiki/en/Ireland_Catholic_Church_Records for an excellent overview of research methods. Be sure to use all of the links given in the WIKI article. 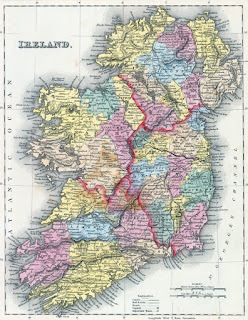 Then access the Irish Genealogy Toolkit website at http://www.irish-genealogy-toolkit.com/trace-family-history.html. RESEARCH TIP: Handwriting styles in these parish registers range from beautiful penmanship to seemingly random scrawls decorated with ink blots and attempted erasures. If you need help reading the registers, go to the U.K. National Archives website and learn from: “Palaeography: Reading Old Handwriting 1500 – 1800,” at http://www.nationalarchives.gov.uk/palaeography/. Ancestry.com has a similar course available at its website, and the "Teasure Maps—Online Genealogy Newsletter" webpage may help you, too: http://amberskyline.com/treasuremaps/oldhand.html. RESEARCH TIP: When we move to a new place, we search for something that reminds us of “home.” If you have ancestors of a specific ethnicity, be sure to look for churches, synagogues and/or mosques that focused on that identity. Although Vido lived in San Marino during his retirement years, he traveled to Alhambra to attend and support a church that was familiar to him in language and ritual. 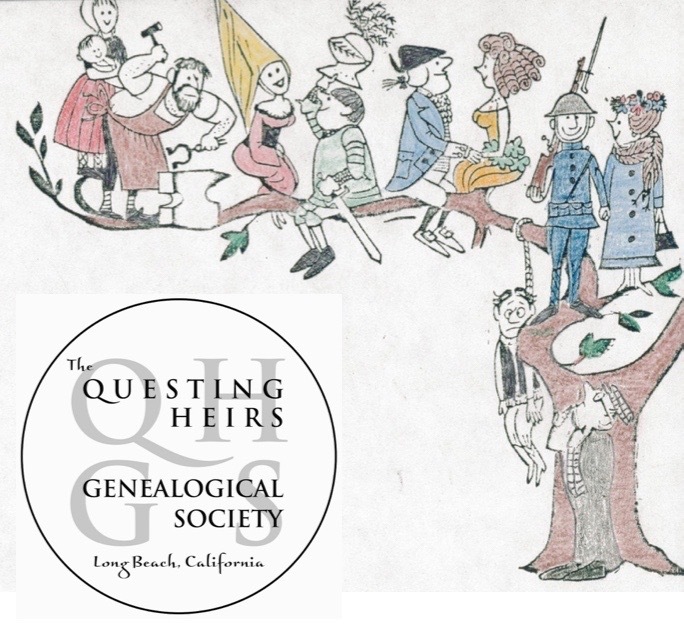 QHGS is the number one genealogy resource in the Long Beach area, and we’re here to help YOU! Need an obituary, a tombstone photo, pictures of an old residence, or some newspaper research? Contact us at questingheirs@gmail.com. We’ll be happy to assist you with requests for look-ups in Long Beach, California. Do you have an ancestor who died in the state of New York between 1629 and 1900? 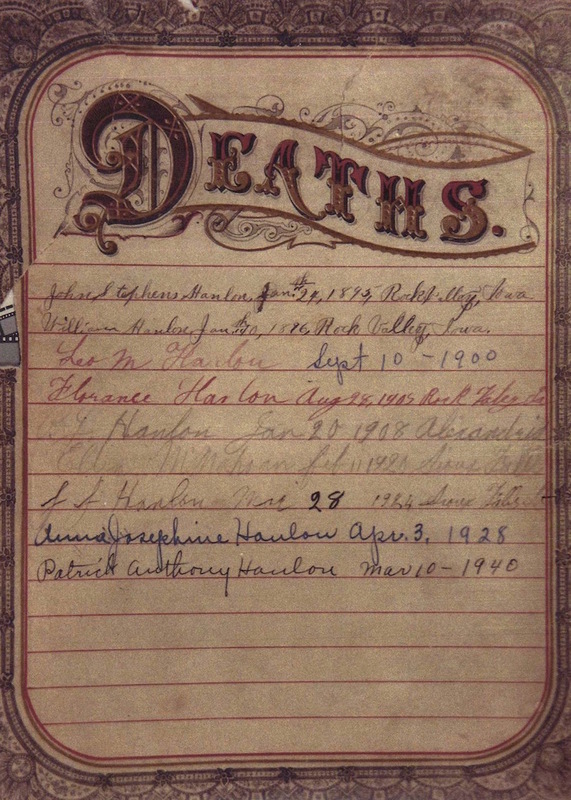 Are you interested in finding probate records for that person? In 2014, FamilySearch put over 18,000,000 unindexed New York probate files online. Browsing that many images page-by-page is an impossible task, even if the search can be narrowed down to a specific county; so—what is a poor genealogist to do? Learn how to use the SAMPUBCO website where you will find a FREE INDEX to many New York probate records! Let’s use David Peck’s will (shown above) as an example. How did the QHGS Blogger find it? 1. I went to the SAMPUBCO website at http://www.sampubco.com/ and clicked on the “wills” link. 2. This took me to the “Will Testators List.” I clicked the “New York” link on that page. 3. That took me to the “New York Counties Will Testators Indexes” page. I knew that the Peck family had lived in Schoharie County, so I clicked that county’s link. 4. This took me down the page to the correct county where there are links to alphabetical groupings of surnames: A-E, F-L, M-S, T-Z. I clicked on the “M-S” link. 5. That took me to an alphabetical list of surnames beginning with M through S of the will testators in Schoharie County. The list is arranged by the name of the testator, followed by the place of residence of the testator, the county’s number, the volume number of the probate court record, and the page number where the will appears in that volume. 6. I scrolled down that page until I found the name of David Peck. Then I copied the information that SAMPUBCO provided: volume A2, page 370. 1. Using the data found above, I went to the FamilySearch website at https://familysearch.org/ and clicked the “Search” button. 2. This took me to the Search page where I clicked on the map of the United States under the “Search By Location” heading. I scrolled down the little menu to “New York” and clicked on that link. 4. This took me to the home page of the New York Probate Records database. Once there, I clicked the “Browse through 14,065,639 images” link. 5. I chose “Schoharie” from the list of county links that appeared, and that opened a list of all of the Schoharie County digitized probate images that FamilySearch has put online, grouped by type. 6. Since I was looking for a will, I scrolled down the page until I found “Wills 1829–1870 Vol A–B” and, keeping SAMPUBCO’s information in mind, I clicked that link and looked at volume A. 7. There was an index in the front of the volume, and I checked it to make sure I had accessed the correct book. Sure enough, image 19 showed that David Peck’s will would be found on page 370, just as the SAMPUBCO index had indicated. It was now fairly easy to find page 370 (image 166) and download the court clerk’s transcription of David Peck’s will. RESEARCH TIP: You can use SAMPUBCO indices for other states as well. It is one of the most useful websites for genealogical research available on the internet, and we thank its creator for making the index free for everyone to use. Genealogists use the term “Brick Wall” to describe an impasse in family history research. For example: all relevant information about parents, grandparents, and great-grandparents is known, but the names of one of the maternal great-grandmother’s parents are not known. Her line cannot be extended back in time until this problem is solved. You may be able to break down a brick wall by researching the brothers, sisters, and cousins of the person who seems to be “the end of the line.” These siblings and cousins are called “collaterals,” and their documents often provide the information you need. A brother may have listed his parents’ names on his marriage license application, even though the primary person you are researching did not. If you have a three-line death notice for your primary ancestor, a sister’s obituary might be much longer, giving her birthplace and leading you to the area where the family was living at that time. RESEARCH TIP: Don't limit your research by focussing solely on the direct line of your tree. Spread out your inquiries to include all of the siblings as well. You will not only glean more information about your direct ancestor this way, you may also discover fascinating things about the family that your relative did not know! As you push your family tree farther into the past you will notice that your female relatives are often identified only by the surnames of their husbands: “Mrs. E. E. Page,” “Mrs. William F. Nugent,” etc. This custom makes finding their original surnames difficult, and successful research depends on finding that elusive maiden name. 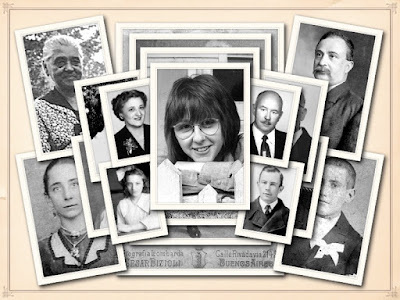 “Finding Females in Your Family Tree” is a free 60-minute video class. 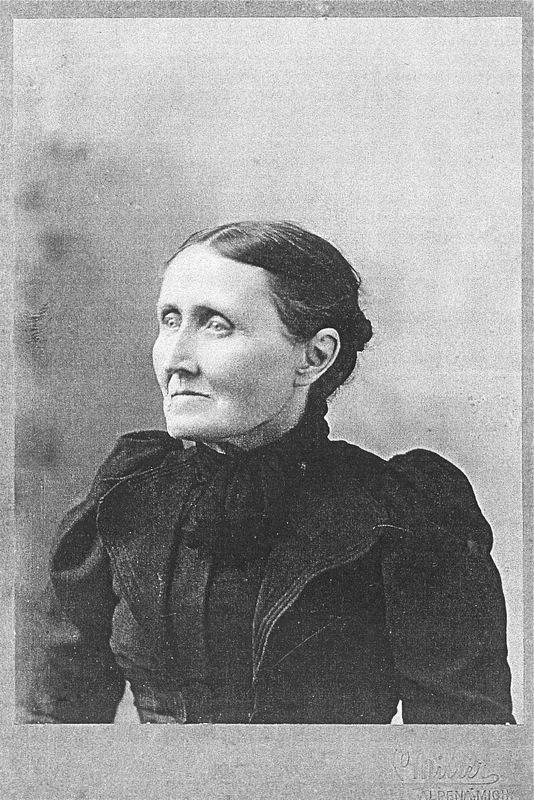 View it at https://familysearch.org/learningcenter/lesson/finding-females-in-your-family-tree/76. “Maiden Name” is at http://www.genealogy.com/articles/research/00000516.html. “Maiden Names: Tips for Finding Them in Your Research” http://freepages.genealogy.rootsweb.ancestry.com/~katw/Maiden_Names.htm. RESEARCH TIP: Ten articles were contributed to the FamilySearch WIKI by The National Institute for Genealogical Studies in June of 2012. They are excerpts from the course Research: Grandmothers, Mothers and Daughters-Tracing Women by Lisa Alzo, M.F.A. and are copyrighted; so, your QHGS Blogger cannot reproduce any of the content here. However, you can access them by going to the FamilySearch WIKI at https://familysearch.org/learn/wiki/en/Special:Search?fulltext=true&search=female+ancestors&searchbutton=Search. 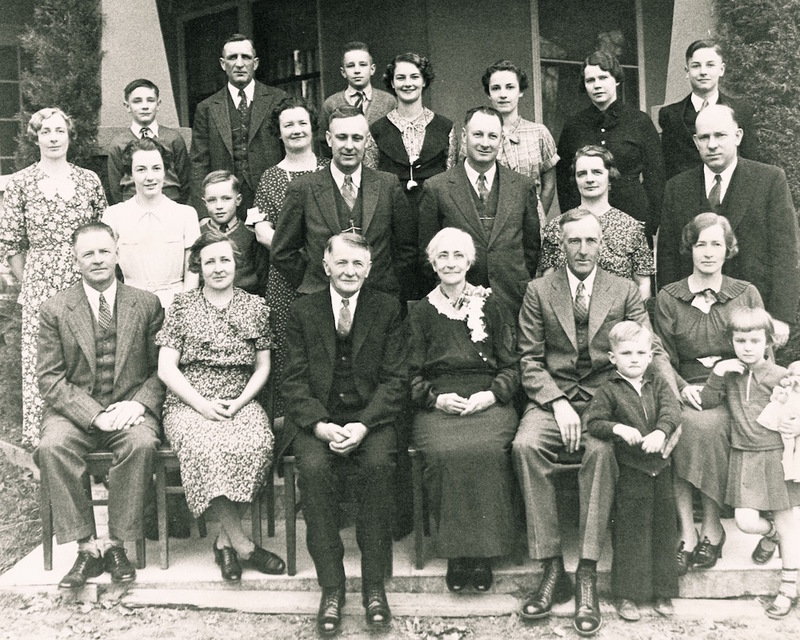 Although it is tempting to leap into a genealogy project by focussing on your parents and grandparents, YOU are number one on the ahnentafel table of your genealogy; thus, the foundation of your personal family history rests on you and no one else. Begin with yourself. RESEARCH TIP: Develop good research habits from the very beginning by paying special attention to the entries you make about yourself, e.g., your “date and place of birth” entry should cite your birth certificate properly. If you do not have a copy, obtain one for your files. You may be surprised at what you learn from your own birth certificate—many people have discovered that they were actually named something other than what they were called all their lives! What do records written in Family Bibles tell us? Are they always reliable, primary sources? What do they really say? Let’s examine a page of deaths and dates to help us answer these questions. 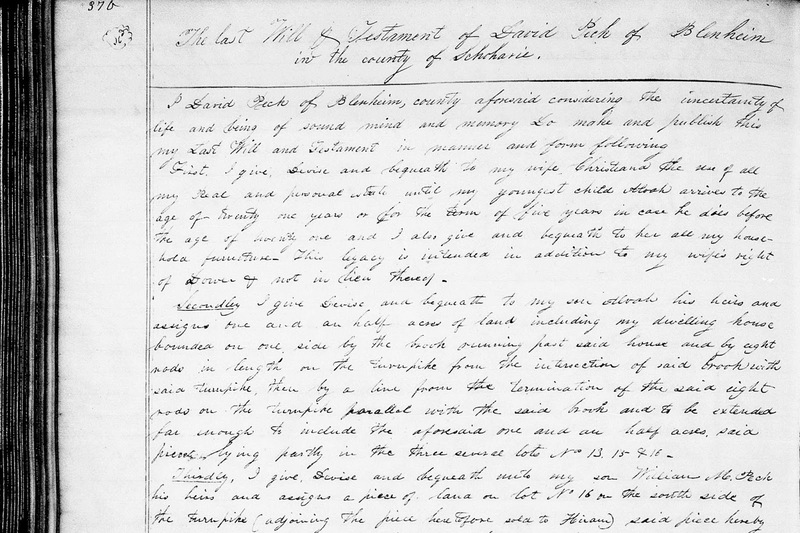 When you look at a Bible’s “Family Records” section, keep this question in mind: Is the handwriting identical in every entry? If it is, chances are good that the person entering the information was copying an older list; transcribing what another person was telling him/her; or, writing names and dates from memory. Such a list would be a secondary source. If it is not, there is a strong possibility that the entries were made by several different people, each entering a name and date at the time the event occurred. 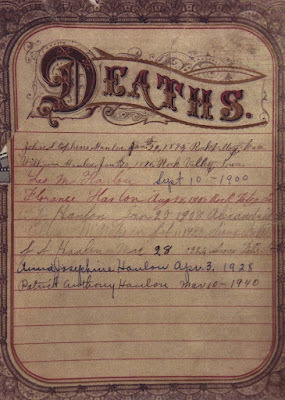 Entries on the “Deaths” page above appear to have been made by four different people, indicating that some of the entries may have been made at the time of the event recorded. These would be primary sources but, be careful—note that the date of “Sept. 10—1900” written next to “Leo M. Hanlon” is in the same hand as the last two entires which occurred many years after 1900. That date was probably added at the same time that the last two entires were made; and, it may not be correct. RESEARCH TIP: Always examine a Family Bible’s title page carefully, keeping this question in mind: What is the publishing/copyright date? If the publishing date occurred after dates recorded in the Bible, those records are not contemporary with the events described and must be proven true. 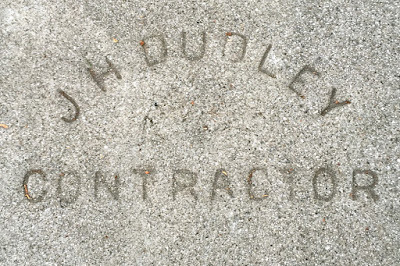 John H. Dudley was a cement worker who lived in the California Heights area of Long Beach at 3738 Orange Avenue with his wife Nelle. 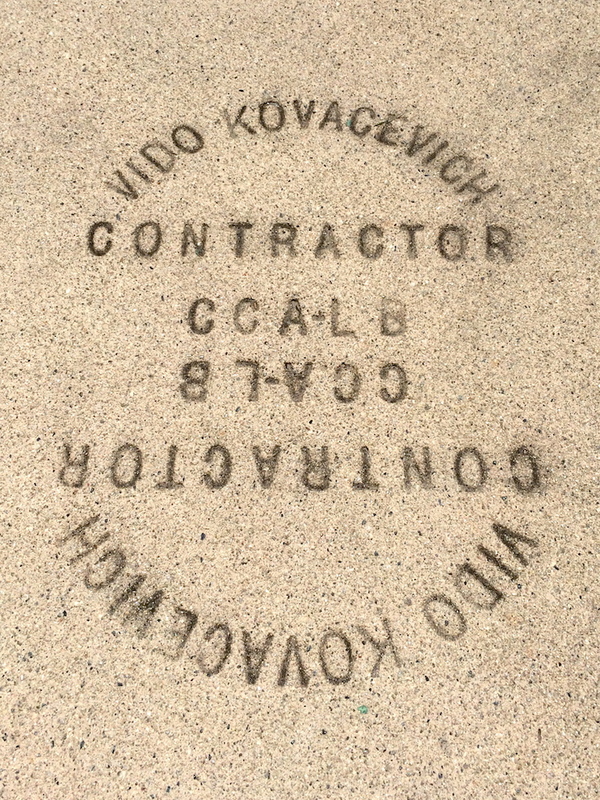 His insignia appears on many of the neighborhood’s sidewalks so he didn't have to travel far to go to work! Address Source: Polk’s Long Beach, California City Directory 1935; R. L. Polk & Co. of California, Publishers ©1935. One of the benefits of belonging to a genealogy club is the opportunity to learn from knowledgeable speakers who present lectures at the Society’s meetings. 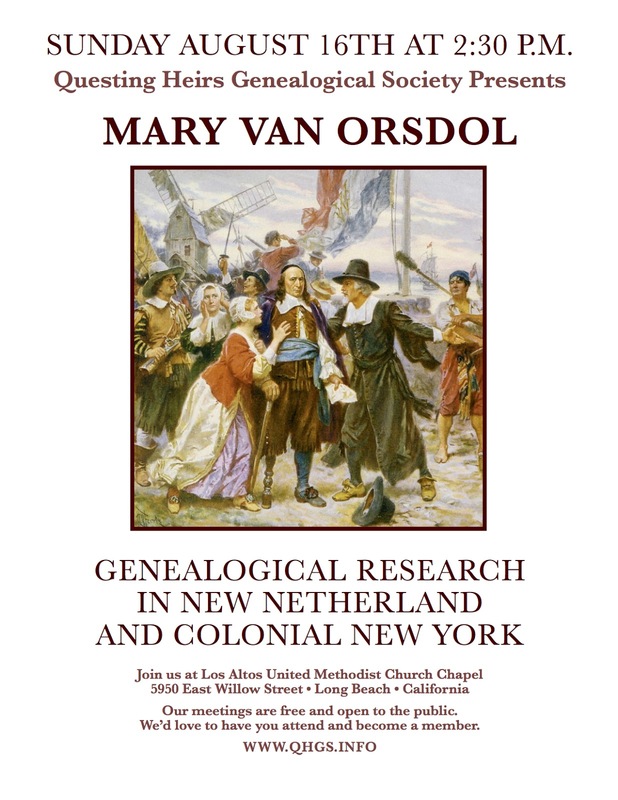 If you have Dutch ancestors who came to what is now New York state in the 1600s, you won't want to miss our featured speaker Mary Van Orsdol’s presentation later this month. 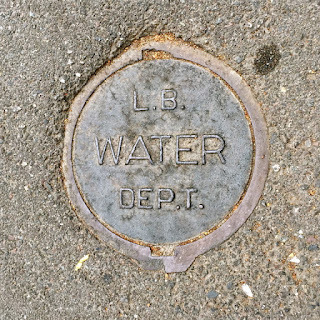 http://www.lbwater.org/history-department. 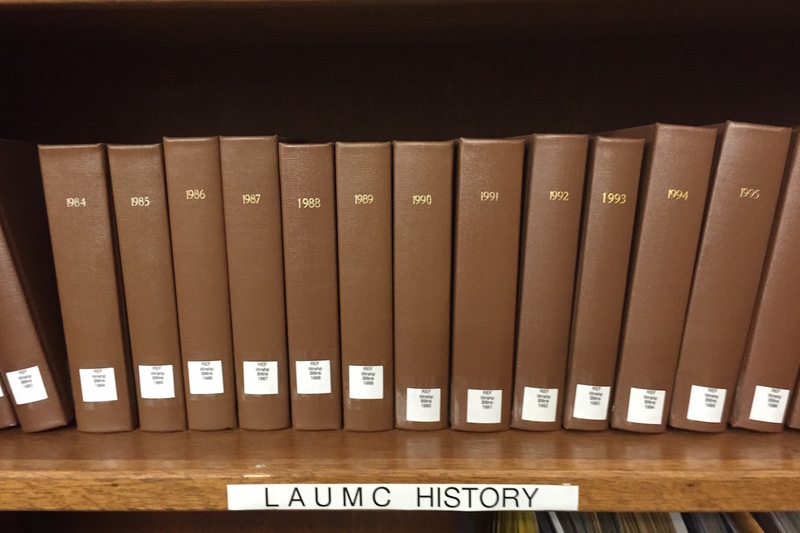 You can download a pdf that covers the department’s history 1945–2000 at http://lbwater.org/sites/default/files/file_attach/pdf/history.pdf. 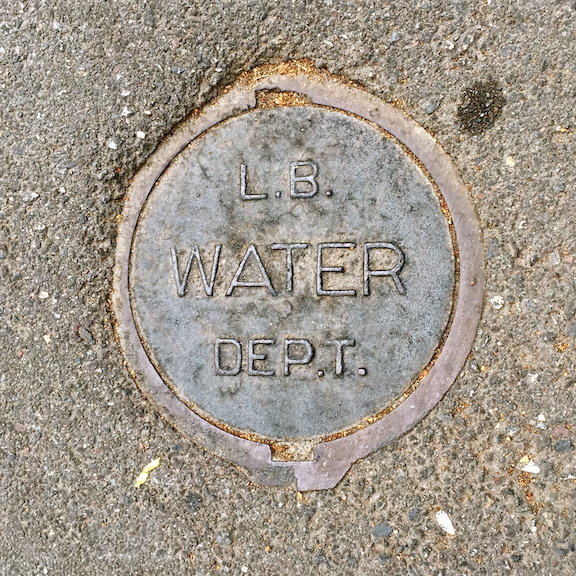 The Water Board has its own webpage at http://www.lbwater.org/board-history. Past and present commissioners are listed, and a short history of the Board is provided. QHGS had an “Introduction to Genealogy” booth at two shows–one in1975 and one in 1976–because we wanted to get the word out about our fascinating pursuit. Forty years later, genealogy has become the second most popular hobby in the United States, thanks to television programs that promote interest in ancestors, and websites on the internet that provide access to thousands of records. 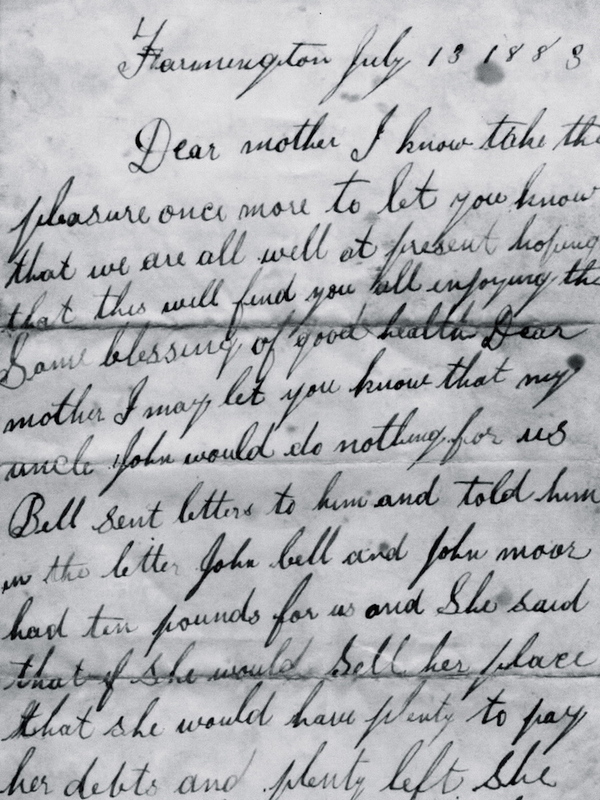 RESEARCH NOTE: How did you first become interested in your family history? Did your parents tell you stories about their childhoods? Were you trying to find out when your relatives came to the United States? Whatever the source of your interest may be, every researcher knows that when the genealogy bug bites, it bites hard! 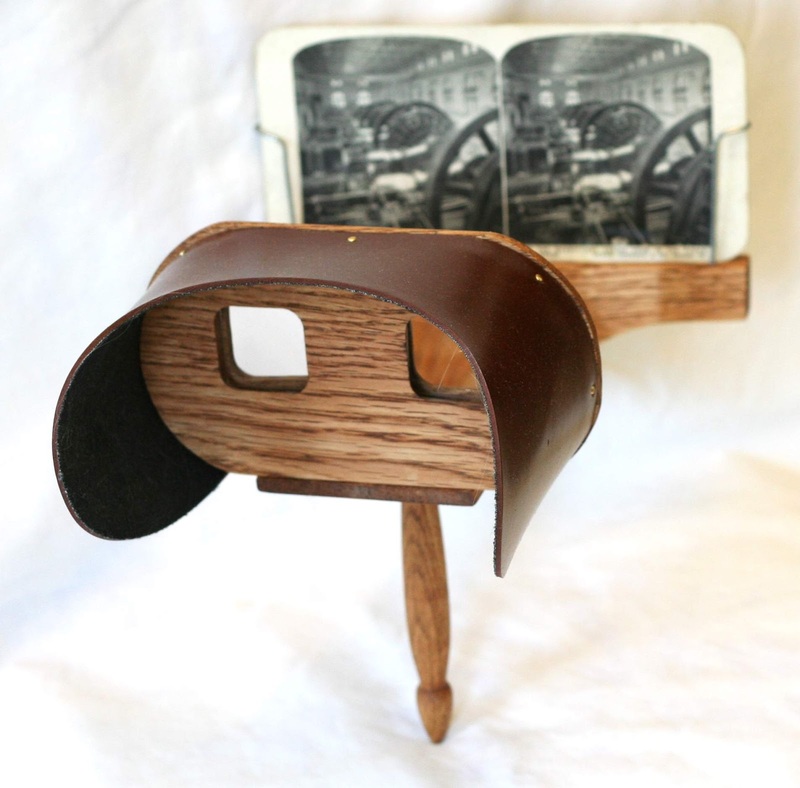 Using the device, you could visit cities and countries all over the world or watch an amusingly risqué story unfold in 3-D, one card at a time. Today these images can add interest to your genealogical photo collection. For example, you can find out what the port of Hamburg looked like the year your ancestor left Germany, and also what Castle Garden looked like when he arrived here in the U.S.
http://www.loc.gov/pictures/collection/stereo/ will give you over 9,000 digitized stereographic pictures. Go to https://en.wikipedia.org/wiki/Stereoscope to read about the device itself. Then go to https://commons.wikimedia.org/wiki/Category:Stereo_cards to explore all the categories and sub-categories of stereo cards available on the internet. “Stereographic Views of Louisville and Beyond, 1850s to 1930” is at http://digital.library.louisville.edu/cdm/landingpage/collection/stereograph. http://content.lib.washington.edu/stereoweb/ will take you to old views of Washington state. The NYPL Digital Collection is available at http://digitalcollections.nypl.org/search/index?utf8=%E2%9C%93&keywords=stereographs. RESEARCH TIP: We genealogists are so grateful to discover names written on the back of old group photos; yet, we don’t always label our own photographs so that future generations will be able to identify the people in them! Don't short-change your descendants—label your photographs, whether they are the old hard copy paper variety, or digitized jpgs in a computer file. The GenWeb: A Forgotten Resource? Newcomers to genealogy usually access FamilySearch.org, Ancestry.com, and Find a Grave.com to begin their research; and then, if they draw a blank at those three sites, they assume that all available sources have been exhausted. Of course this is not the case. Most of the USGenWeb (USGW) is still online, offering genealogical information from states, counties and cities—information that is free. Family photographs, Civil War rosters, post cards, immigrant lists, ship manifests, newspaper articles, plat books with maps, township records, obituaries, wills, cemetery transcriptions and gravestone photos, church and school listings—the number of resources available at USGenWeb sites is staggering and includes records that can be found nowhere else, records transcribed by thousands of volunteers during the early days of the internet. Access this wonderful resource at http://usgenweb.org/. The USGenWeb Archives is a category unto itself. It is a collection of vital records transcribed by volunteers from courthouse ledgers, old newspapers, county histories, city directories, and family Bibles, along with many other sources. Photographs and old postcards can also be found in the archives. Don’t look down your nose at the old U. S. Census transcriptions; you can use these to find people mis-indexed in the Ancestry.com database. RESEARCH NOTE: The GenWeb began as a volunteer project 20 years ago, and it remains a valuable source of information today. As genealogy becomes “corporate” in nature, we give kudos to the USGenWeb for keeping genealogy free. 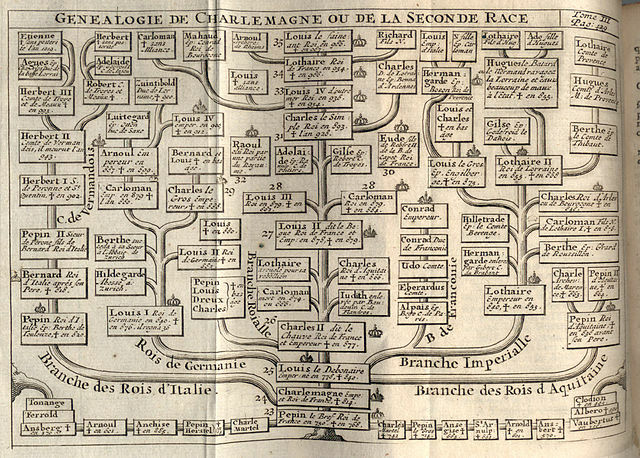 This chart shows the descendants of Charlemagne, King of the Franks and first Holy Roman Emperor. 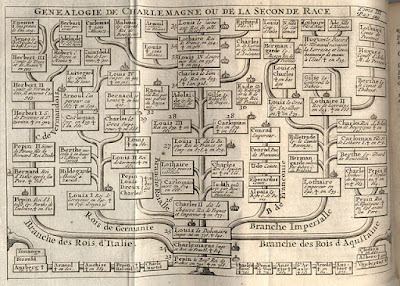 The design places Charlemagne and his father, Pepin the Short, at the base of a tree trunk with descendants arrayed in the branches. Charlemagne united most of Western Europe during the early Middle Ages and laid the foundations for modern France and Germany. RESEARCH NOTE: Do you like to collect genealogical memorabilia and ephemera? You can tell that the QHGS Blogger certainly does! 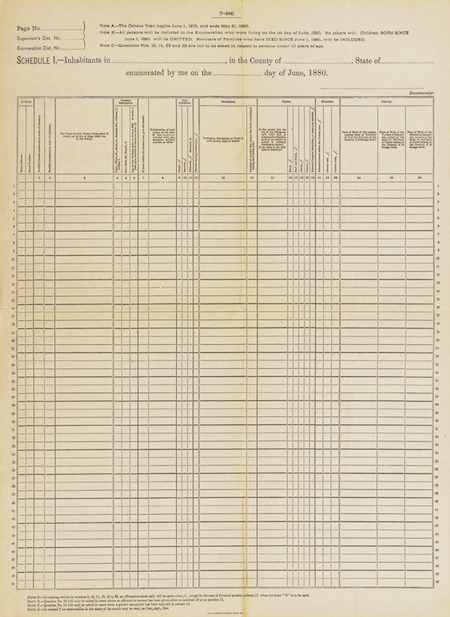 Old charts like this are fun to look at, and they can inspire you to create new designs for your own “pedigrees from the present.” Next Saturday we will begin a new series called “What Does It Say?” that examines old documents in detail.